TO THE MANOR DEAD The Queensville Heritage Society is restoring the once-grand Dumpe Manor. While Dumpe relatives and society members use the occasion to dust off old grudges, Jaymie Leighton prefers to adorn the kitchen with authentic Depression Era furnishings. 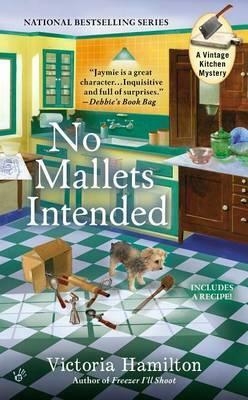 A collection of vintage wooden mallets found in the house is a perfect addition to her display, but one also offers a late-night intruder the perfect weapon to knock Jaymie unconscious before escaping. Though the attack has everyone on edge, nothing is missing from the house. Perhaps it was merely a vagrant who thought the place was still abandoned. But when Dumpe Manor's resident historian is murdered with a mallet from the same collection, it's time for Jaymie to turn up the heat on the investigation before someone else becomes history. Includes recipes! As Victoria Hamilton, Donna Lee Simpson is the national bestselling author of the Vintage Kitchen Mysteries as well as the Merry Muffin Mysteries and is also a collector of vintage cookware and recipes.